(Nanowerk News) September 2008 will see particle physicists setting protons on a collision course through the Large Hadron Collider with more energy than ever before. Their intention is to track down the Higgs boson and solve the problem of why the universe contains almost no antimatter. Physicists from the Max Planck Institute for Physics and the Max Planck Institute for Nuclear Physics are playing a crucial role in the experiments and their preparation. It’ll be completely obvious that this photo is a set-up,” protested Siegfried Bethke, Director at the Max Planck Institute for Physics, resisting the suggestion that he pose in front of the diverter magnet of the Large Hadron Collider. “Normally, no one ever turns up to work here wearing a tie.” It’s true: 100 meters below ground, there are no ties or suits to be seen. Currently, work to finish the Large Hadron Collider, or LHC, the largest storage ring in the world, at the European Research Center for Particle Physics (CERN) near Geneva, is progressing at full speed. With an investment of four billion euros, 24 years of planning, development and construction, and around 7,000 employees, the LHC is one of the largest research projects that the world has ever taken on. In the four underground caves that contain the large-scale experiments, physicists want to uncover the secret of why matter exists and how it came about. The result of these collisions in the accelerator can well be called a mini Big Bang – which is exactly what the researchers want. They want to reproduce in miniature what happened when the world was created: “We are looking, as it were, for dinosaur particles from the prehistory of the universe,” explains CERN physicist Rolf Landua, Head of the Education Group. The detectors capture any new particles that are created in the collision, register their direction, charge and energy, and the physicists hope for new findings from this data. Particle physicists will be moving into unknown territory in their field. And two Max Planck institutes will be among them: the Max Planck Institute for Physics in Munich is involved in three systems in the ATLAS detector, and the Max Planck Institute for Nuclear Physics in Heidelberg is working on the LHCb experiment. “It’s a foregone conclusion that we should be working on this international project,” says Siegfried Bethke. “After all, we are continuing the research work that Werner Heisenberg started at our institute.” Furthermore, in his view, the project could not manage without the experience of Munich-based Max Planck researchers in developing innovative particle detectors. 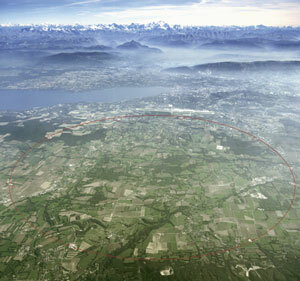 Above ground at CERN, there is almost no sign of hectic activity, as the giant accelerator lies embedded in the semicircular area of flat land east of the French Jura, opening out toward Lake Geneva. Picturesque villages and vineyards surround the research center, many of whose buildings are getting up in years. 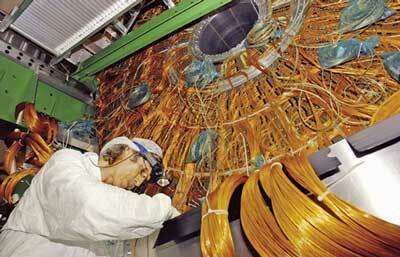 CERN celebrated its 50th birthday in 2004. The goal of the particle researchers at CERN is to reveal the secrets of creation. According to a theory proposed 40 years ago by physicist Peter Higgs, the Higgs boson, which was named after him, gives matter mass. Physicists are now hoping to generate this elementary particle with the LHC. They base their optimism on the extremely high energy with which the protons, a component of atoms, are shot at each other. They disintegrate on impact, and new particles arise from the energy of the collision. The collision energy must be particularly high to create a Higgs boson, as it is a very heavy particle. Since, according to the theory of relativity, mass and energy are equivalent, more energy than usual is required to produce Higgs bosons. Up to now, accelerators have not achieved energy at this level. 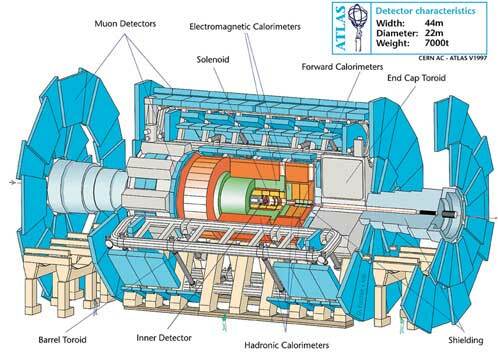 One of the experiments that could show the existence of Higgs bosons is the ATLAS detector. This colossus stands inside superconducting magnetic coils that could hold two tennis courts. It surrounds one of the collision points in the accelerator, where billions of protons will collide with others coming from opposite directions. The measuring devices have the task of recording the trajectory, momentum, electrical charge and energy of the particles that are created. ATLAS uses a combination of different measuring devices for this, and researchers at the Max Planck Institute for Physics are working on three of them. The Institute has invested 6.1 million euros in the project since 1996, and spent another 6 million euros on infrastructure. As they exit, the particles dissipate their energy in a liquid argon calorimeter. They create showers of secondary particles in massive copper plates that generate tracks of argon ions in liquid argon between the plates. These ions induce a voltage that can be detected with a gallium arsenide electronic system. This particularly robust electronic system was also developed in Munich. “It is very important that the electronic system generate as little heat as possible, as bubbles would be created in the liquid argon at such low temperatures,” explains Horst Oberlack, a scientist from Munich and project leader of the ATLAS calorimeter system. The total of all the tracks in the sandwich structure makes it possible to reconstruct the initial energy of the particles. Based on these principles, end-cap calorimeters were developed to measure particles that escape close to the LHC beam axis. They sit on both ends of the cylinder-shaped detector like enormous millstones. One of the end-cap calorimeters was entirely constructed by the Max Planck Institute in Munich. 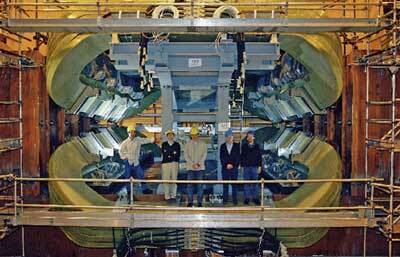 Muon chambers define the outermost detector layers of ATLAS. Muons, which are also called heavy electrons, sometimes arise via an intermediate step when Higgs bosons decay. They are the only particles that are able to completely penetrate the detector. The 1,200 muon chambers have a total surface area of 2,000 m2; 100 of them were constructed at the Max Planck Institute for Physics. With these chambers, muons can be identified and their speed and energy determined from their deflection in the magnetic field. If the muons occur at a preferred combination of momentum and energy, they probably originated from a decaying Higgs boson. All in all, this has been a supreme effort on the part of the institute: 27 physicists are currently involved in LHC activities. Siegfried Bethke, who has been associated with CERN for a long time, is one of them. “CERN is a home away from home,” he says. “I came here for the first time in 1978 as a student and was immediately fascinated.” Since then, he has even spent four years living close to the research center. Michael Schmelling, a physicist at the Max Planck Institute for Nuclear Physics in Heidelberg, came to CERN via a similar route. He arrived here for the first time in 1980 after completing his intermediate examinations for general university studies, and since then, the research center has never released its hold on him. Even when he has not been a constant presence on site, as was the case in the four and a half years during which he lived here, he has been working on CERN projects since his graduate thesis and dissertation. Since 1997, he has been in charge of the work of the Max Planck Institute in Heidelberg at CERN, which concentrates on the LHCb experiment. These physicists approach the secrets of the cosmos in a way that is quite different from those working on ATLAS. Why, they ask, is there almost no antimatter in our world, although as much antimatter was created during the Big Bang as matter? And why does matter exist in our universe at all when they should have destroyed each other? “Clearly, the symmetry between matter and antimatter is not perfect,” explains Schmelling. “Although we know what kind of symmetry breaking we need, up to now, we haven’t found the origin of this asymmetry, which safeguards the existence of our world.” Antimatter is indeed different from matter, in which all the positive charges are replaced by negative charges and negative charges by positive. Certain rare decays of neutral B-mesons are particularly suited to tracking down the crucial difference between matter and antimatter. In mesons, a quark and an antiquark come together in states that exist for only a very short time. In B-mesons, one partner is a b- or an anti-b-quark. Pairs of these B-mesons, of which one contains a b-quark and the other an anti-b-quark, are generated in the LHC in approximately 1 percent of all proton-proton collisions, along with many other particles. They fly out of the collision at almost the speed of light. However, since they live for only 1.5 picoseconds, which is less than a trillionth of a second, they travel only about 1 centimeter before they decay. Particularly interesting for the antimatter researchers are decays in CP eigenstates. These are final states from which it is impossible to determine whether the original particle was a B-meson or its antiparticle. If there were no difference between matter and antimatter, the rate of decay would be the same in both cases. Today it is known that there are differences; the rate at which the B-mesons decay is not the same as that at which the equivalent anti-B-meson disintegrates. The LHCb scientists want to measure these differences more accurately than ever before. Their goal is to discover new phenomena that are not described by their current theories. To do this, the scientists must filter out and closely analyze those of the hundreds of trillions of proton-proton collisions in which B-mesons disintegrate into a final state that is interesting for the examination of matter-antimatter asymmetry. The LHCb experiment is designed for precisely this purpose. 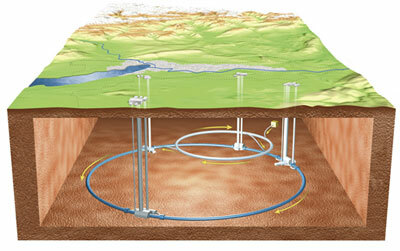 It is a 20-meter-long detector weigh­ing 4,500 tons. Its separate components are arranged in a row along the direction of the beam. The Max Planck Institute for Nuclear Physics worked mainly on the silicon tracking system, the innermost part of the detector that registers the trajectories of the particles close to the beam pipe in order to determine the energy/momentum of the products of decay. “We played a big part in the development of the silicon detectors,” says Schmelling. “However, our main job was to develop the read-out chips. If they don’t work, then LHCb is dead.” To ensure that that doesn’t happen, the chips must be extremely resistant to radiation. “If we had built the read-out electronics with commercially available components, they would have failed after a few hours of operation. These here are intended to last 10 years.” After development at the Max Planck Institute for Nuclear Physics, the chips were manufactured on an industrial scale and then tested thoroughly before they were installed in the experiment in Geneva. Like these chips, almost all the components in the new accelerator are at the limits of what is technologically feasible today. To return to the elephant example, this means that a herd of more than 100 elephants needs to be kept in check – that is, confined inside the pipe. “That’s not so easy, and we need to be very careful,” says Michael Hauschild. For this reason, the beam intensity – the size of the herd – must be increased very gradually over two or three years to allow the scientists to learn to control the new dimension of radiation energy. A highly sophisticated control and safety system is intended to prevent, under any circumstances, the beams from escaping from the vacuum pipe and thus destroying the LHC magnets or the detectors. This would mean lengthy down-time for repairs. “So the elephants must not be allowed to break out,” says Hauschild. All kinds of records have been broken in the attempt to meet the technical requirements: 15 years ago, building 27 kilometers of reliable superconducting magnets was considered impossible. All 1,624 major magnets have now been delivered and most of them have been installed. The remaining few are still being tested on the eight specially constructed test benches. The ATLAS experiment includes the largest superconducting magnet in the world; it was put into operation for the first time from July to November and worked immediately. In order to cool the superconductor, CERN maintains the largest reservoir of liquid helium in the world. In the main magnets alone, 40,000 connectors had to be made vacuum-tight. 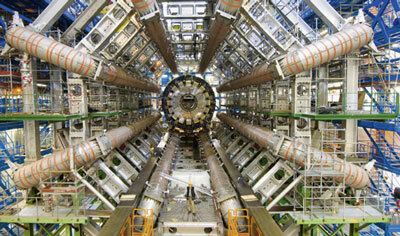 The precision with which the accelerators and all the detectors have been set up is also unparalleled. Automatic monitoring systems with thousands of lasers and cameras ensure that every distortion caused by heating, material fatigue or gravity is detected and compensated for. Dealing with the enormous amounts of data is particularly challenging. There will be an average of 600 million collisions per second. This means that, while the experiments are ongoing, the CERN computer center will be engulfed by a data tsunami: the information received per second is equivalent to the text printed in all books in every library worldwide. Only a fraction of it is of any interest and, on average, only one collision in every 200,000 will be saved. This must be filtered from the rest of the data as quickly as possible. Hundreds of physicists and computer specialists have worked on designing an electronics system that could make these selections in a practical way. Nevertheless, 20 billion snapshots will accumulate every year, all of which need to be evaluated in detail.